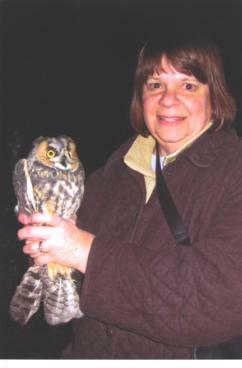 This post is about Hawk Ridge family owl night and owl adoption, and has a book review of Twelve Owls by Laura Erickson, with illustrations by Betsy Bowen. Hawk Ridge is in Duluth, MN, and has an opportunity to adopt owls through donations, and thereby have an opportunity to hold and release a owl. Twelve Owls has just been published by the University of MN Press. Usually Betsy Bowen illustrates children’s books so my husband surprised me with this book which is not written for children and is a highly informative nonfiction book about my favorite birds, owls. Chapter one is about my favorite owl, the Saw-whet. However, I’m writing about this book today as there are some wonderful birding opportunities with the fall migrations happening at this time. 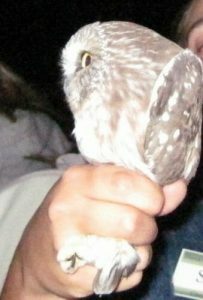 We went to an owl banding session at Hawk Ridge raptor center, where they band owls on Saturday evenings well after dark. The public is invited and if you arrive early, you can adopt an owl to release and have your photo taken. Of course, I wanted to do that, but many parents had already signed up their children for this fabulous opportunity. At this link are dozens of wonderful photos from Hawk Ridge, and if you click the photos enlarge and the bird is identified. If you go birding with children, they will naturally ask many questions. I highly recommend Twelve Owls to help answer any and all questions about owls. Laura Erickson even lives with a owl! My photos of a Saw-whet banding are not great as I am not a night photographer, but I want to share them anyway, below. Right now is a wonderful opportunity for families to visit their own local bird banding stations or nature centers. The report from yesterday at Hawk Ridge (Duluth, MN) included the banding of an adult bald eagle, which is a rare event even there. 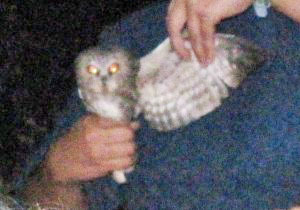 The migrations there will go on for about six more weeks, but this week is the last time they will band owls. Last week during the day, they banded hundreds of different kinds of hawks such as the Red-Tail hawk, and other raptors. These birds may be adopted and so released by the general public. I encourage families to view fall migrations and help your children develop a wonder of birds. 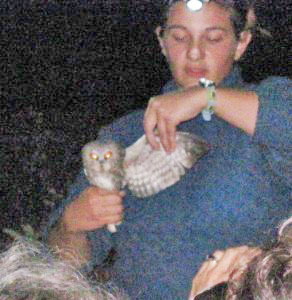 At this evening, I adopted a female long eared owl and was able to hold it! 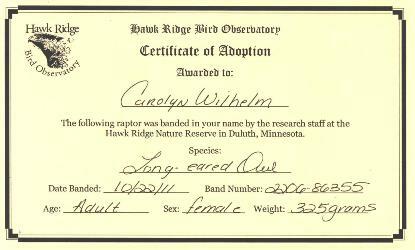 When owls and other birds are adopted at Hawk Ridge, they give a certificate.